There is no denying that one of the reasons why we lose weight is to brag about how much we have lost. The best way to do this is to track exactly how many pounds you have lost since the beginning of your diet and exercise regime. The easiest way to do this is by using a weight loss tracker. 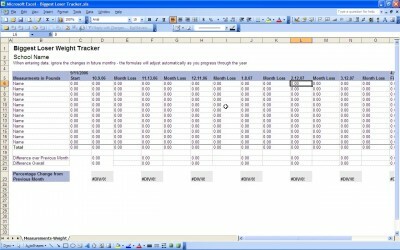 What Is A Weight Loss Tracker? It really is exactly how its name sounds. This is something that individuals use as part of their excel program in order to visually see how many pounds they have lost over a certain period of time. It is great at what it does because it displays the information that the person on the diet wants to see. They can look at their weight loss tracker each day for motivation as they watch themselves add more and more pounds to the lost list. Before they know it, the amount that they wanted to lose in the first place will be gone. It is quite clearly the case that this tool is needed to help people lose weight because it provides them with something that they probably could not otherwise have. That is to say that it provides them with the motivation that so many point to as something that they need. Therefore, you will find that you want to get the tracker installed on your computer before you ever even begin your weight loss routine. By having it already on there and ready to go, you are saving yourself a lot of trouble of having to do all of this work in the future. It will simply be ready to go for you from day one, and that is an incredible feeling when you first start out knowing that it will be there.